We worked through Framing the Big Picture—a framework for describing current reality and a desired future state, as well as exploring the context and stakeholders. The scope of their desired futures was sobering: establishing a media free from control by politicians and business people; counteracting rumors propagated by state media; getting the military out of politics and back into their barracks; building political awareness in rural areas where democracy seems most unfamiliar. I have to confess to a moment of insecurity. Would the tools that I was offering seem equal to the task? Just as I was thinking this, one of the participants expressed impatience with planning processes in general. 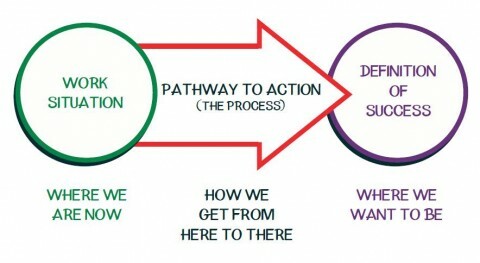 But then we got into Designing Pathways to Action—a framework for sequencing discussions during a planning process. We were on our feet moving from space to space within the pathway and the group was more engaged. The participant who expressed impatience with planning shared a story. Four days before the revolution in Egypt, a friend of his share with him plans to launch the revolution. He didn’t think it was possible. He said he had to apologize! I still wasn’t sure about whether the tools seemed up to the enormity of the tasks before this group. But, in the end, they found great value in these simple tools and even asked if we could come to Egypt to bring these and other tools to their colleagues and communities. What an affirmation! These visitors reaffirmed something I’ve experienced repeatedly over the past 18 years. The tools and frameworks on which we have built our practice are scalable: they work for small projects in tiny volunteer organizations and for efforts that take place on a national or even international stage. They are flexible and transportable across lines of culture, language and other differences. And, they reflect the kind of elegant simplicity that results from working through complexity. How refreshing to work with these folks! Thanks for sharing.